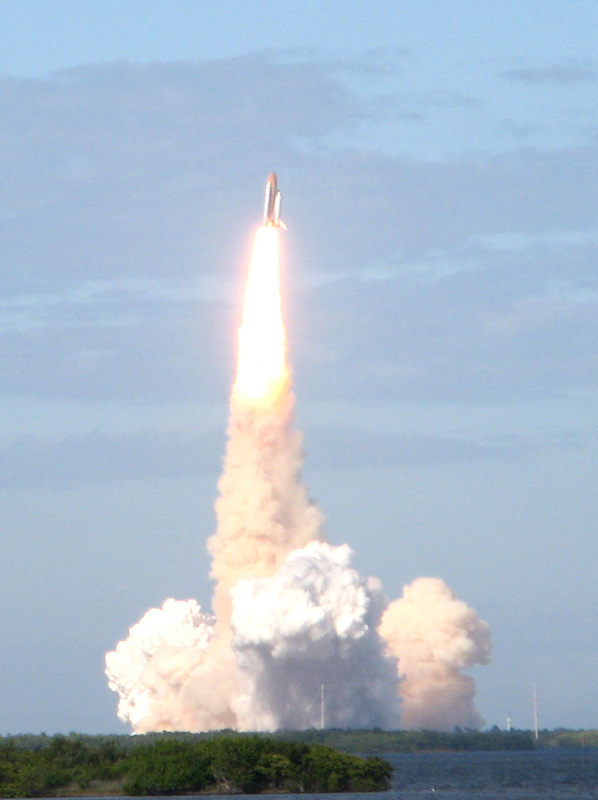 I had bought my “Launch Transportation Ticket” for the STS-129 Space Shuttle launch within seconds of them becoming available (at 8:59:40 EST on October 20th). This ticket gets you out to the NASA Causeway, which at six miles away is as close as the general public is allowed to a shuttle launch. I got up bright and early for the launch, left the Radisson at 6:01am and was parked at the Kennedy Visitor Center by 6:26, way early for my designated 7:00am arrival. And it would probably have been fine to arrive by 9:00 or later. As I drove in, I saw lots of cars heading into the NASA staff road. At the NASA Causeway, I ambled down to the extreme left end and secured a spot at the top of the metal bleachers by 12:25. In theory these are reserved for Boeing guests, but our bus driver had gently hinted that probably no-one would mind if we (discreetly) wandered in. They ended up less than a quarter full, with most people standing or sitting in camp-chairs. So I got an excellent unobstructed view. The afternoon was overcast (good from a temperature and sun-protection point of view) and there were very strong breezes, but apparently neither factor was an issue for the launch. As scheduled, at 2:28pm we got a beautiful, glorious, clean lift-off. Now, the shuttle was six miles away and was a barely visible half-matchstick in the distance. But the launch generated a vast cloud of steam (from the sound suppression water system) and then a vast contrail, with an intense burning light from the engines, so it was very visible. I’ll confess that I was mostly looking through my viewfinder – I got some good snaps. It was much smokier (actually steamier), much brighter and much quieter than I had expected. The smoke/steam does come across on TV, but the raw brightness doesn’t. The steam obscured the engines for the first few seconds, but then they were very bright! I had anticipated a major roar of noise, even at six miles. But there was only a mild rumble and then some quiet pops of sonic booms. (But I was in the middle of an excited and noisy crowd.) It was a pretty impressive sight, but at the same time, it was kind of brief and distant, so there was an odd mixture of wild excitement and a tinge of oh-my-god-its-already-almost-over. On the way back to the Visitor Center, we got a sales pitch from the driver about supporting NASA, the Shuttle , and space exploration in general. He fell into a few of the standard “do this for side effects” weak arguments but actually mostly kept to the “do it for the adventure” spirit, which is the one that sells me. It was a great experience. If you haven’t seen a launch yet, do it now, while you still can.